Perma Plaster Mix is a grey free flowing powder which needs only addition of water to form a good consistency mortar. Perma Plaster Mix is a mortar mix with log of advantages over conventional mortars. Perma Plaster Mix is reinforced with PP fibers. the resulting plaster is waterproof. For small repair works there have been lot of in conveniences. bringing sand sieving and mixing the mortar for plaster have worked our very expensive for small repair jobs. such small repairs of plasters have created shrinkage cracks. 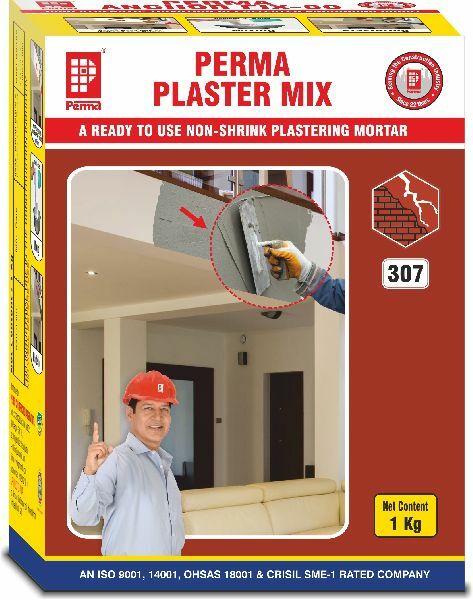 to avoid all these difficulties, Perma has introduced Perma Plaster Mix a ready to use plaster mortar for plastering. Perma Plaster Mix jut requires addition of water to produce plastering material with the least hassles a nd all the advantages. Perma Plaster Mix can be used advantageously on big site where a good quality water proof plaster work is desired. Perma Plaster Mix produces absolutely non shrink mortars. it is economical when compared with the inconveniences of procuring and sieving right grades of sand. the material is workable and has ease in application.